I have never felt so close to religion as when in Turkey. The call to prayer wafts over the landscape on a strict schedule in tune with the sun; five times a day the melodic urging beckons the faithful to pray. There is a quiet adherence to centuries old tradition as markets and tea shops empty and people make their way to the local mosque to start their ablutions and prayer ritual. The mosques are nothing short of stunning. Every single one of them. Built as testaments to faith they transform prayer into personal messages; an undeniable beauty accompanies the process and I was often, probably rudely, transfixed as I watched. Merhabah! I totally agree – Turkey and it’s rich history enveloped me in a way I was not expecting. 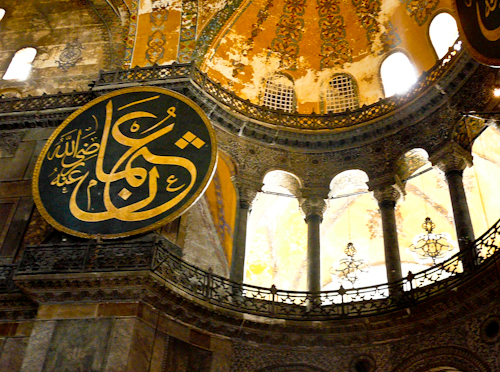 Hagia Sophia was perhaps the single most stunning building I have ever been in, and it swept me away. I know I commented in an earlier post that I too found the call to prayer so powerful and so amazing – I was fully expecting to find it annoying, but it had the complete opposite affect on me – it didn’t matter whether it was 5am or 11pm – LOVED IT. I would return to Turkey in a heartbeat. Even looking at the photos just transports me back. Long live being a global nomad – there’s so much balance to be found in travel!